Below is Aaron's inventory of unused and used pressure leaf filters. 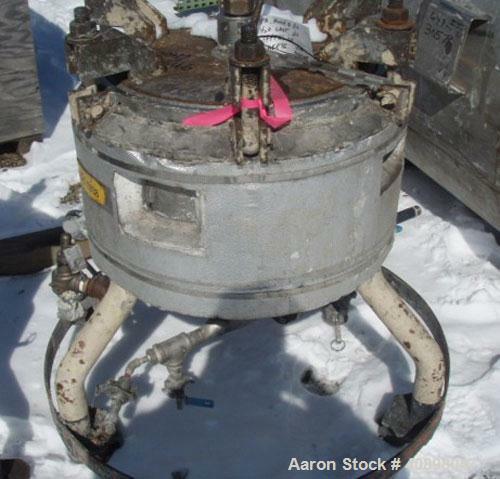 If you are looking to sell your used pressure leaf filter submit a request online or contact Erik Eichert at 630-238-7480. Used- Sparkler Filter Inc. Plate Filter, Model 14" Nutsche, 316 Stainless Steel. 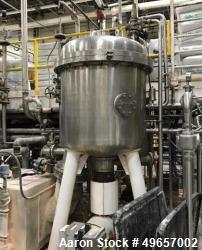 Used- Monarch Separators CETCO Hi-Flow Coalescing Media Filter. Capacity 5,000 BPD (148 GPM). Effectively removing oil from 100 ppm to 0 ppm. Overall dimensions: 2-5" diameter. x 9-6" total height. Construction material: ASME SA516 Grade 70 Steel. 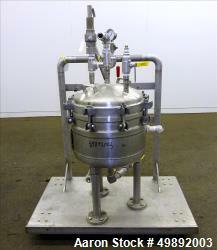 Used- Velo S.P.A. Vertical Leaf & Tank Filter, Model CFV35, Stainless Steel. 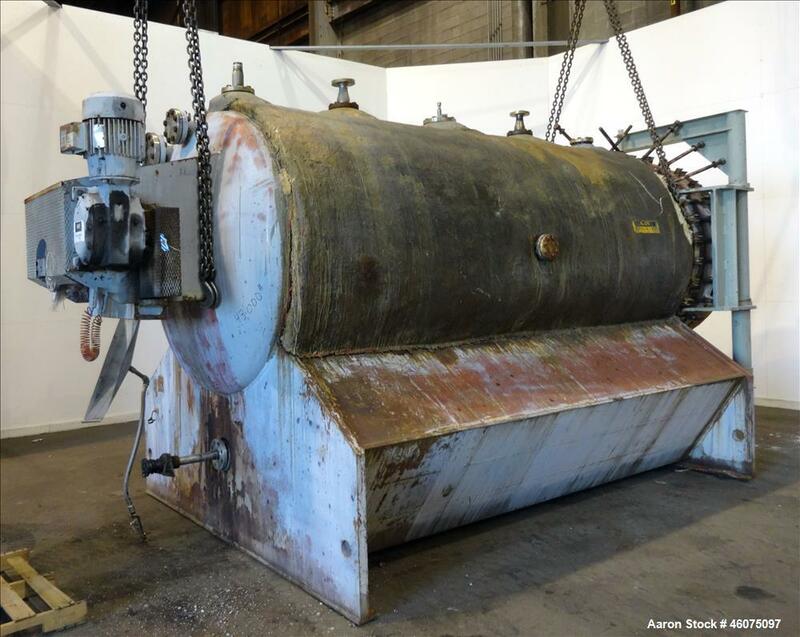 Tank approximate 48” diameter x 41” straight side, dished removable top on davit arm, coned bottom. (18) Vertical filters. Serial# V0018450, built 2010. 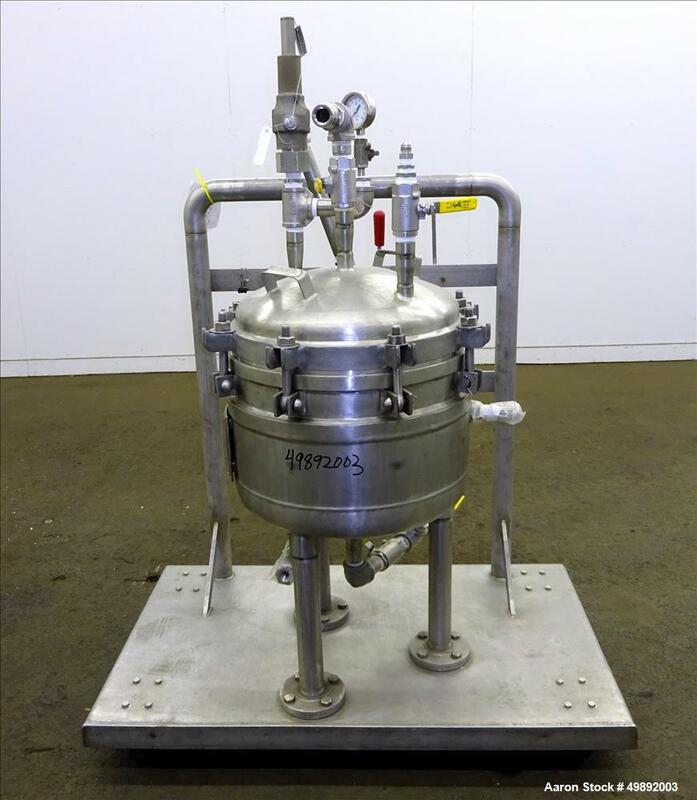 Used- Schenk Centrifugal Discharge Pressure Filter, Model ZHF-SR7-KLKB1, 316L stainless steel, vertical. 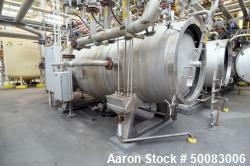 Vessel rated 150/FV at 350 deg F, 163 gallon volume. Agitated filter stack, driven by a 2.5-15 hp, 10-60 hz, 96-460 volt, 260-1760 rpm XP motor. Built 1993. Certified by Richard Stihler, National Board #376, serial #12439. Used- Sparkler Filter. 4 sq foot. Stainless steel. 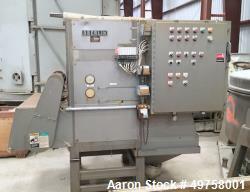 Used- Oberlin Fully Automatic Filter, Model OPF-4. Used- Niagara Horizontal Plate Filter, Model 18-4-D. 304 Stainless Steel. 7.4 Square feet surface area, (.95) cubic feet cake capacity, rated 75 psi, (4) 18" diameter plates, on legs. Serial #F79827. 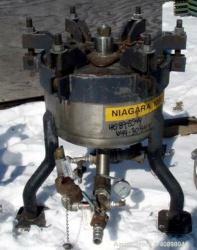 Used- Niagara Filter, Model 18-6-S. Stainless steel construction, 11.16 square feet surface area, .81 cubic feet cake capacity, rated 75 psi at 300 deg F internal, jacket rated 50 psi at 300 deg F, (6) 18" diameter plates, on legs. Serial #F72062. 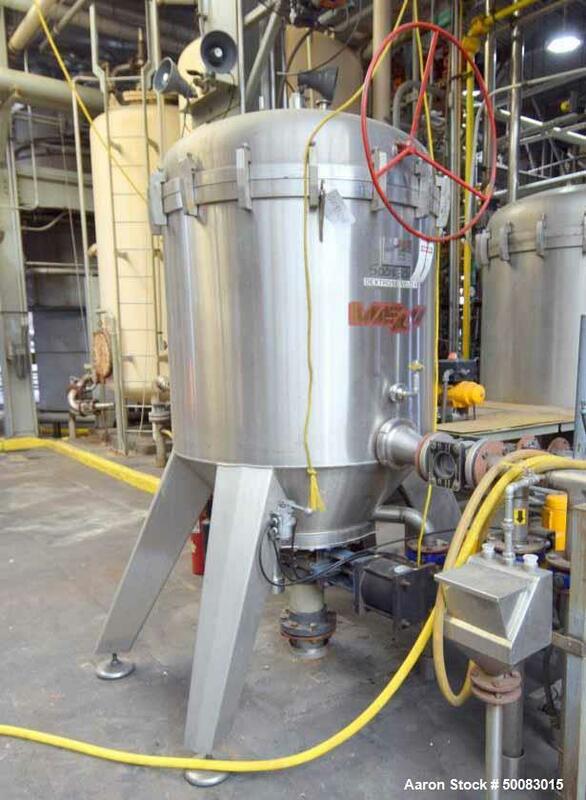 Used- Niagara Pressure Leaf Filter, Model 18-16-D, stainless steel construction, 28.62 square feet of surface area, 3.88 cubic foot cake capacity, rated 75 psi internal, (16) 18" diameter deep plates, serial FX55388-1. 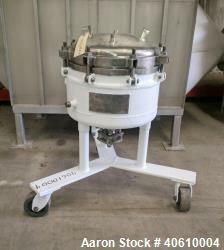 Used- Schenk Filter, Model ZHF-SR-20-KL. Used- US Filter Pressure Leaf Filter. Used- US Filter Pressure Leaf Filter. Auto Jet. 800 Square foot. MAWP 150/FV at 400 deg.F. MDMT -20 deg.F at 150 PSI. Shell is 4'6" diameter x 10' 7" long. Inlet (2) 3", outlet 6", spray seader 3", drain 10". Material 316 stainless steel. Requires 48" filter Leafs. Used- US Filter Pressure Leaf Filter. Auto Jet. 1300 square feet. MAWP 150/FV at 400 deg.F. MDMT -20 deg.F at 150 PSI. Shell is 4'6" diameter x 15' long. Inlet (2) 3", outlet 6", spray header 3", drain 10". Material 316 stainless steel. No elements. Requires 48" filter elements. 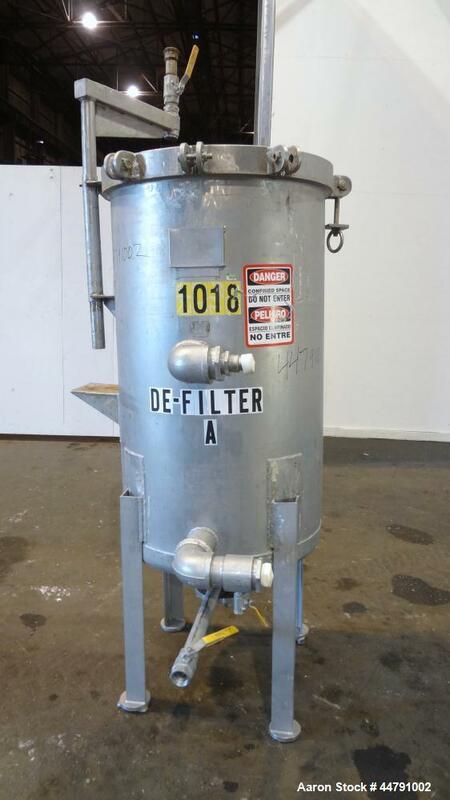 Used- United States Filter Corporation, Model 900, Auto-Jet Self Cleaning Pressure Leaf Filter. 304 Stainless steel. Unit houses approximately (32) 48" diameter leaves. Unit is rated for 100 PSI at 100 F. Straight side length is 11'. One end has drive for rotating the leaves powered by a 2hp motor (missing motor). 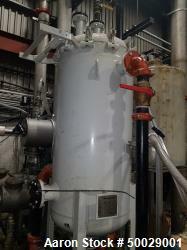 5" center filtrate discharge. (2) 4" inlets for wash and fill. (1) 10" discharge for material collected by the leaves. Opposite end has large swing out door and (1) 1" inlet. (2) 4" side inlets. Covered with insulation. Overall dimensions are 176" long X 84" wide X 90" tall. Approximately 15,000 lbs. Used- Sparkler Filter Inc. Plate Filter, Model 14" Nutsche, 316 Stainless Steel. Approximate square feet, cubic feet cake capacity, gallon per hour capacity. 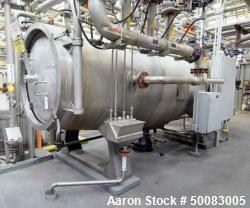 304 Stainless steel jacket rated 14.5 Psi at -20 to 350 degrees F. Internal rated 60 Psi at -20 to 350 degrees F. Chamber approximate 16" diameter x 6" deep. Bolt on dish top cover. Mounted on 3 legs, base with casters. National Board # 2425, Serial # 22740. Built 1990. 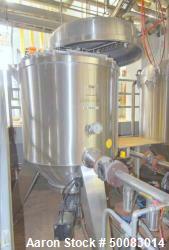 Used- Sparkler Filter Horizontal Plate Filter, 316 stainless steel. Approximately 2.67 square foot filter area, .0018 cubic feet cake capacity. Vertical carbon steel jacketed tank 16" diameter x 8" deep. Bolt-on top cover. (3) 13 3/4'' diameter plates. Approximate 1 1/2" bottom outlet. Mounted on 3 carbon steel legs on a frame with casters. Used- Sparkler Filters Inc. 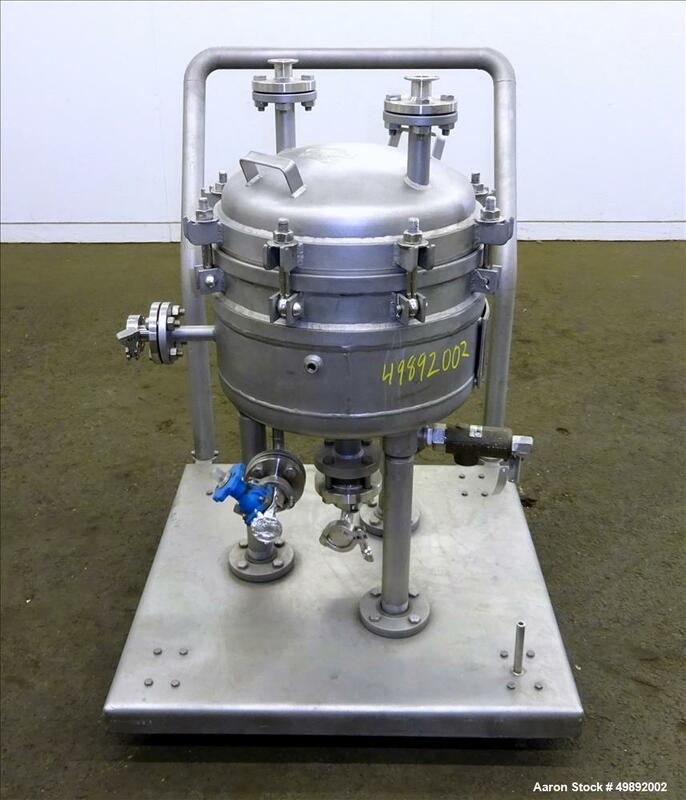 Plate Filter, Model 14-S-4, Hastelloy C276 Stainless Steel. 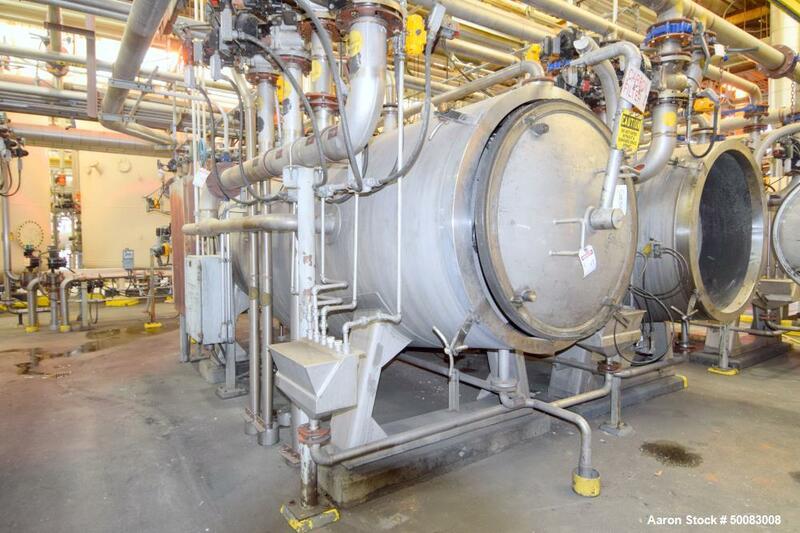 Approximate 3.2 Square feet, 0.21 cubic feet cake capacity, 200 gallons per hour capacity. 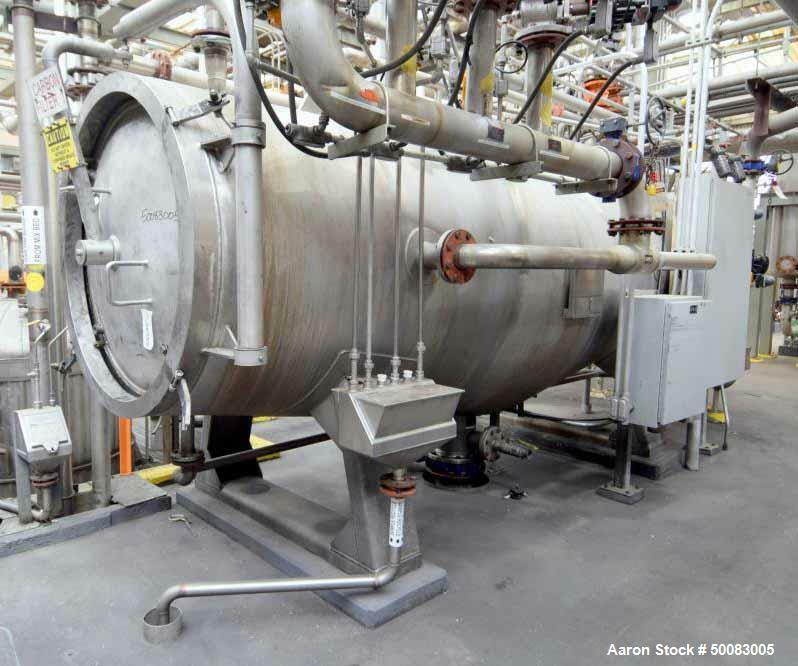 304 Stainless steel jacket rated 14.5 psi at -20 to 350 degrees F. Internal rated 60 Psi at -20 to 350 degrees F. Chamber approximate 16" diameter x 7" deep. Bolt on top dish cover with (2) 1" openings, 1-1/2" center bottom outlet. Mounted on 3 legs on base with casters. National Board # 2641, Serial # 23072. Built 1993. 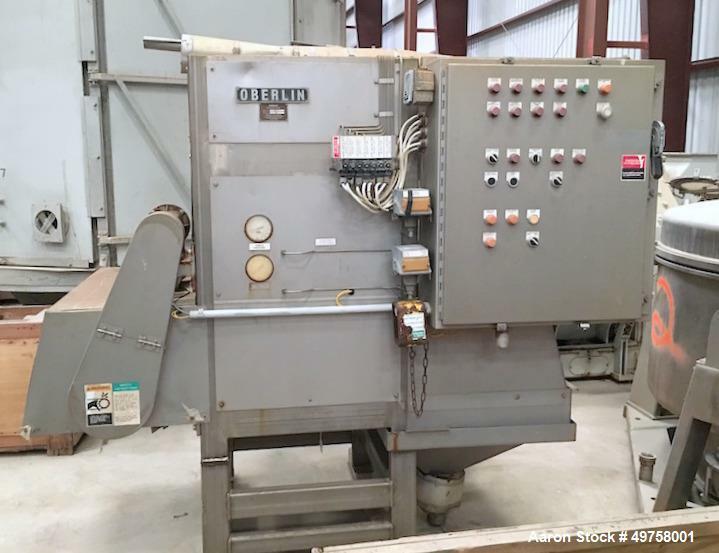 Used- Oberlin Fully Automatic Pressure Filter Press, Model OPF-4. 304 Stainless Steel Shell. 316 Stainless Steel Internal Wetted Parts. Approximately 4 Square Foot (0.4 Square Meter) Area Capacity. Approximately 28'' wide x 60'' long belt. Approximate press area 25'' x 29''. Bottom discharge pan. Cloth Advanced Belt driven by a 1/4 hp gear motor. Includes a Control Panel. Mounted on a frame. Serial # 124. Built 1994. 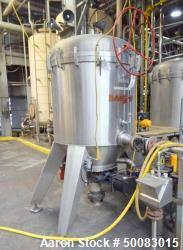 Used-Diessel GMBH Approximately 30 Square Foot Rotating Leaf Jacketed Pressure Vacuum Filter. Sanitary T316L stainless steel construction. 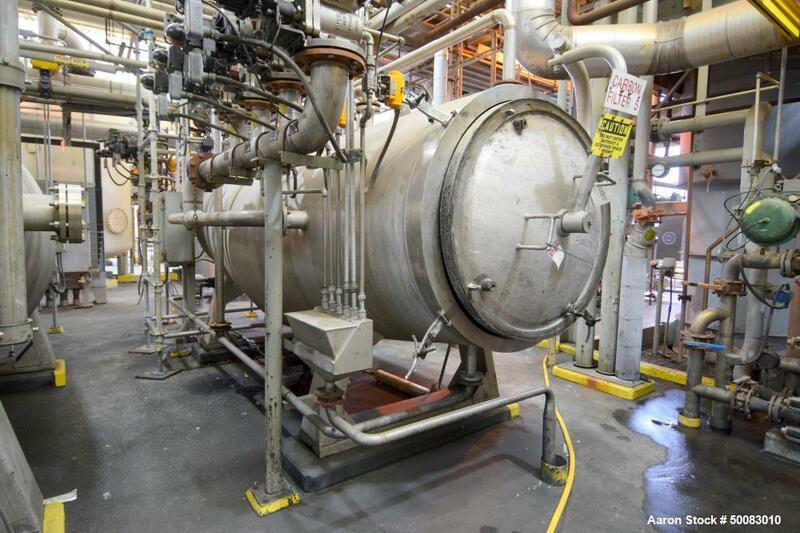 Horizontal tank 21-1/2" ID x 12" deep, electropolished internally with clamps. 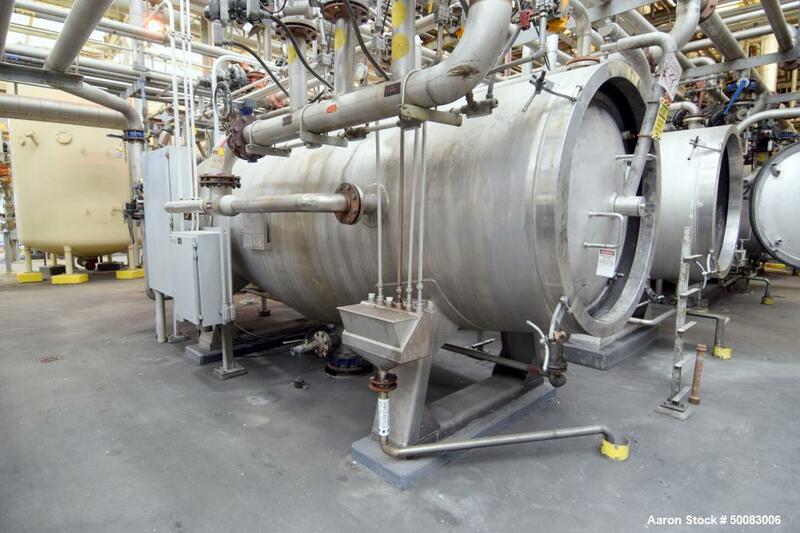 ASME code stamped full vac/87 psi internal, 43 psi jacket @ 300 deg F. Stationary flat head with shaft mounted leaves, tank rolls back on stainless steel track to expose leaves. Has six (6) stainless steel leaves 21" diameter with 1-1/2" space between the leaves. Rotation of shaft mounted leaves is via chain and sprocket drive, sew Eurodrive with 0.8 kW motor, gear reducer with handwheel for varying the speeds. Fitted with seven (7) wash nozzles in tank for sluicing of the leaves. Can also be used for dry cake discharge. Built 1998 but not used. 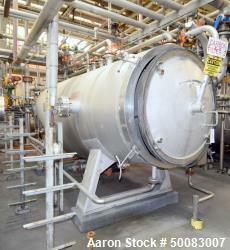 Used- Sparkler HRC Horizontal Plate Filter, Model HRC-150, 304 Stainless Steel. 154.8 Square feet filter area when using (12) plates, unit equipped with (4) plates,25.8 cubic feet cake capacity when using (12) plates. Horizontal non-jacketed tank approximate 48" diameter x 86" long, internal rated 125 psi at -20 to 350 degrees F. Davit swing away dished end. 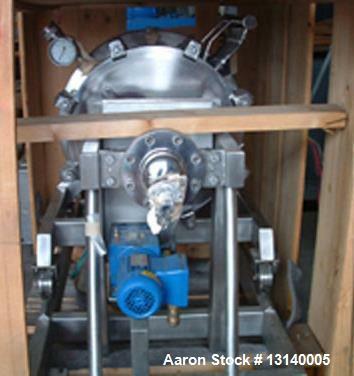 Includes rotating plate discharge, filtrate discharge manifold, dual bottom lump breaker with screw discharge. Serial# 23090, built 1994. 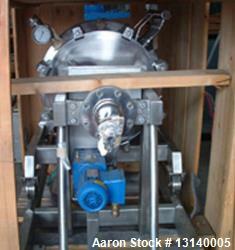 Used- American Plant Equipment Pronto Vertical Plate Filter, 304 Stainless Steel. 161 Square feet filter area, 10.1 cubic feet cake capacity. 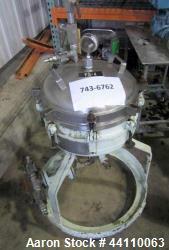 Non-jacketed vertical tank 30"diameter x 50" straight side, dished bolt-on top with arm, dish bottom. Internal rated 75 psi at 212 degrees F. Includes (13) plates, (1) top spray nozzle. 3" Side inlets. 4" Center bottom outlet. Mounted on 4 stainless steel legs. 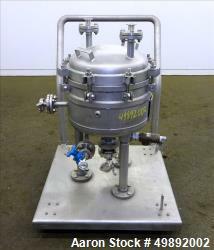 Used- Schenk Filter, Model ZHF-SR-20-KL. 209 Square Feet Area. Internal rated 75 psig at 300 degree F. 316 L Stainless steel construction. With #4 Finish internally and externally. (32) Plates. Distance between Plates: 1.25"; Filtration Screen Mesh: 80 Microns; Maximum Cake Capacity: 22 cubic feet. ; Effective Cake Capacity: 17 cubic feet. Mounted on (3) legs. Serial # 79506CB-2. Built 1980. Used- Schenk Filter, Model ZHF-SR-20-KL. 209 Square feet Area. Internal rated 75 psig at 300 degree F. 316 L Stainless steel construction. With #4 Finish internally and externally. (32) Plates. Distance between Plates: 1.25"; Filtration Screen Mesh: 80 Microns; Maximum Cake Capacity: 22 cubic feet. ; Effective Cake Capacity: 17 cubic feet. Mounted on (3) legs. Serial # 79506CA-2-1, built 1980. 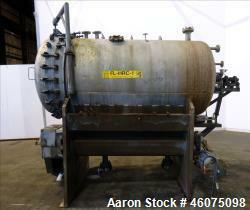 Used- United States Filter Auto-Jet Self-Cleaning Pressure Leaf Filter, 300 Square Feet Filter Area, Model 300/200. 316 Stainless Steel. 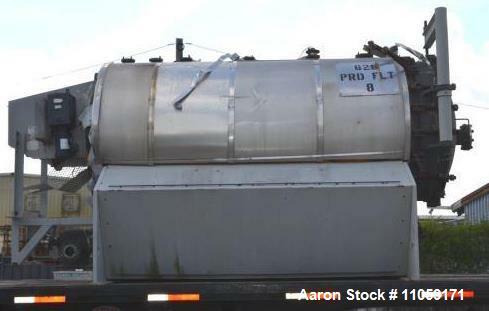 Approximate 25 cubic feet sludge capacity, volume 700 gallons. 54” Diameter x 60” long horizontal shell. 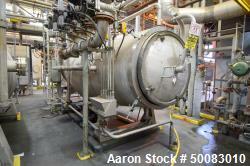 Internal rated 150 psi at 200 degrees F. 10” Discharge, internal spray nozzles and sluice header. 3/4hp Chain driven rotating shaft, vertical leaf. Bolted head and flanged. National Board#1226, serial# 11-1668, built 1976. 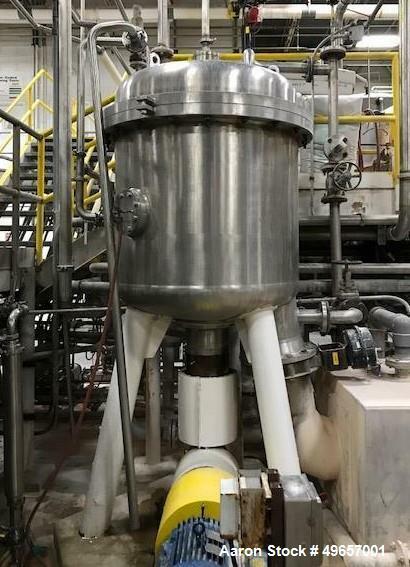 Used- LFC Lochem Roto Jet Wet Cake Discharge Filter, Approximate 990 Square Feet Filter Area, Model RJWCD 92/1200/44 DC, Duplex 2205 Stainless Steel. Approximate (44) 1200mm (47.2”) diameter vertical filter leaves mounted on a rotating shaft, driven by a 2hp, 3/60/440 volt, 1720 rpm motor thru a reducer. Top mounted screen spray cleaning manifold. 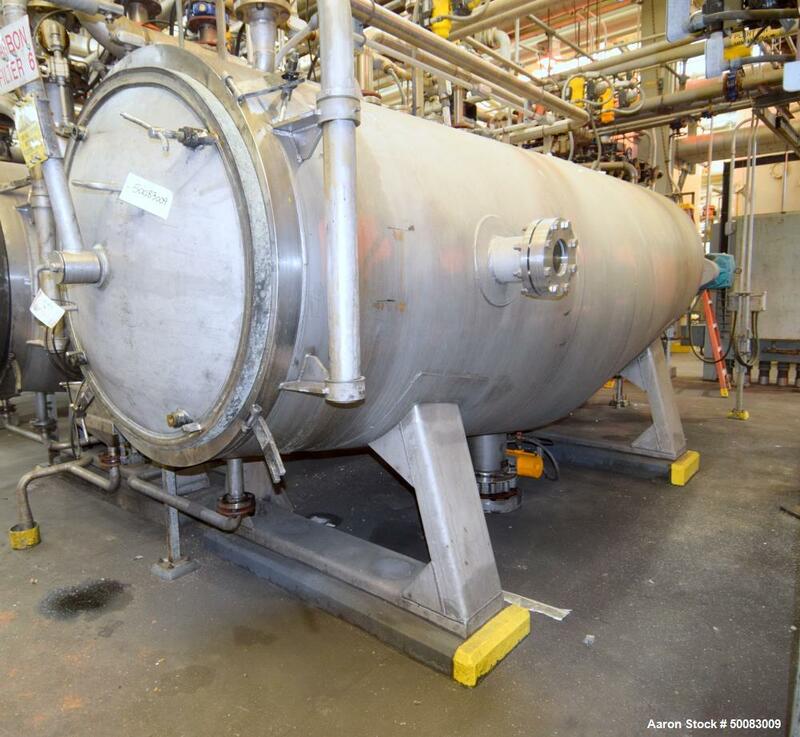 Horizontal tank volume approximate 96.8 square feet, approximate 54” diameter x 180” long, V sump style bottom outlet, (1) end dished, (1) end dished door on a davit arm, rated internal 100 psi at 68 to 212 degrees F. National Board# 010, serial# 99005634B, built 1999. Used- LFC Lochem Roto Jet Wet Cake Discharge Filter, Approximate 990 Square Feet Filter Area, Model RJWCD 92/1200/44 DC, Stainless Steel. Approximate (44) 1200mm (47.2”) diameter vertical filter leaves mounted on a rotating shaft, driven by a 2hp, 3/60/440 volt, 1720 rpm motor thru a reducer. Top mounted screen spray cleaning manifold. 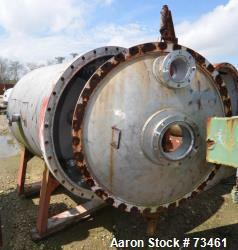 Horizontal tank volume approximate 96.8 square feet, approximate 54” diameter x 180” long, V sump style bottom outlet, (1) end dished, (1) end dished door on a davit arm, rated internal 100 psi at 68 to 212 degrees F. National Board# 009, serial# 99005634A, built 1999. 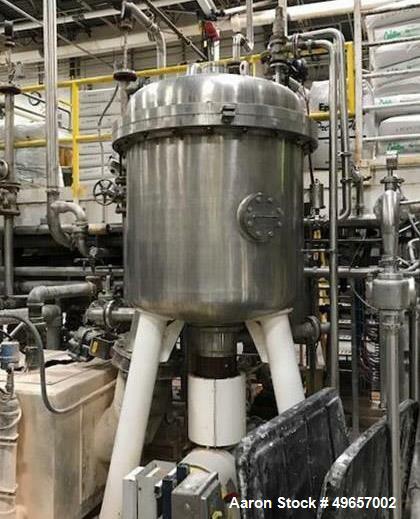 Used- Mahle Industrial Filtration LFC Lochem Roto Jet Wet Cake Discharge Filter, Approximate 990 Square Feet Filter Area, Model RJWCD 92/1200/44 DC, Stainless Steel. Approximate (44) 1200mm (47.2”) diameter vertical filter leaves mounted on a rotating shaft, driven by a 2hp, 3/60/440 volt, 1720 rpm motor thru a reducer. Top mounted screen spray cleaning manifold. Horizontal tank volume approximate 96.8 square feet, approximate 54” diameter x 180” long, V sump style bottom outlet, (1) end dished, (1) end dished door on a davit arm, rated internal 110 psi at 68 to 212 degrees F. National Board# 220, serial# W01300383.1, built 2013. 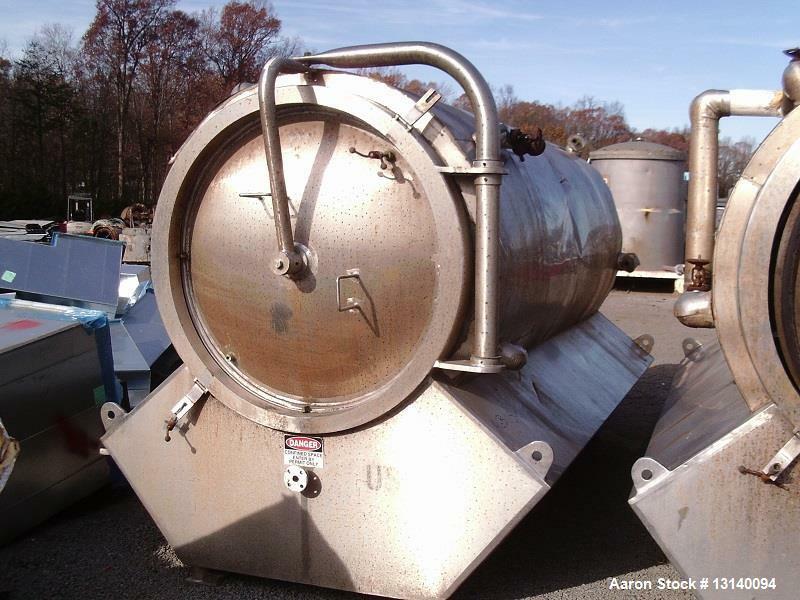 Used- LFC Lochem Roto Jet Wet Cake Discharge Filter, Approximate 990 Square Feet Filter Area, Model RJWCD 92/1200/44 DC, Stainless Steel. Approximate (44) 1200mm (47.2”) diameter vertical filter leaves mounted on a rotating shaft, driven by a 2hp, 3/60/440 volt, 1720 rpm motor thru a reducer. Top mounted screen spray cleaning manifold. 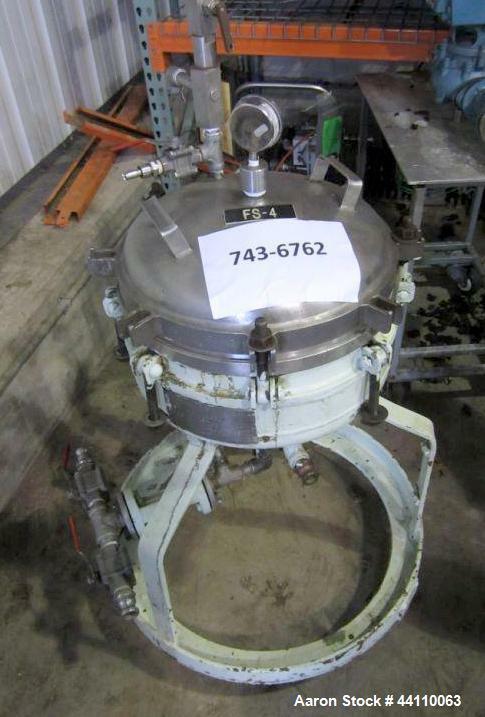 Horizontal tank volume approximate 96.8 square feet, approximate 54” diameter x 180” long, V sump style bottom outlet, (1) end dished, (1) end dished door on a davit arm, rated internal 110 psi at 68 to 212 degrees F. National Board# 70, serial# C0042973, built 2005. 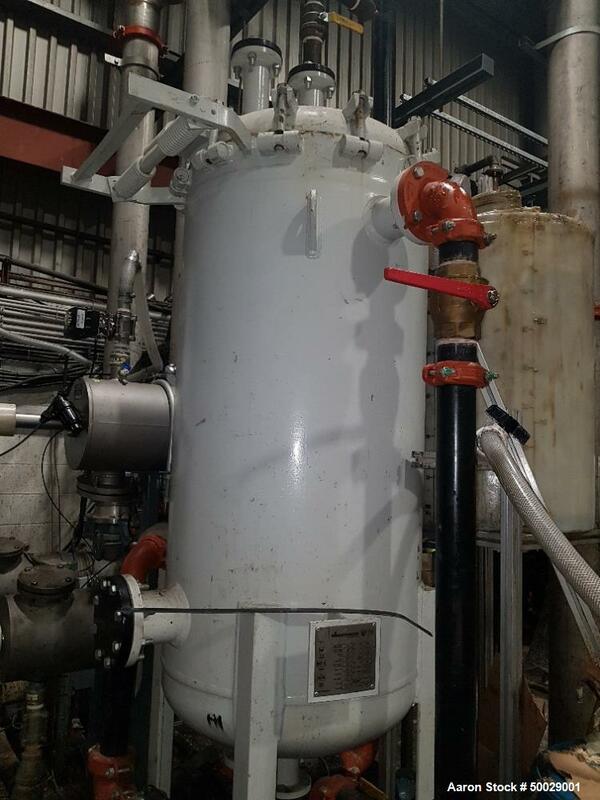 Used- LFC Lochem Roto Jet Wet Cake Discharge Filter, Approximate 990 Square Feet Filter Area, Model RJWCD 92/1200/44 DC, Stainless Steel. Approximate (44) 1200mm (47.2”) diameter vertical filter leaves mounted on a rotating shaft, driven by a 2hp, 3/60/440 volt, 1720 rpm motor thru a reducer. Top mounted screen spray cleaning manifold. Horizontal tank volume approximate 96.8 square feet, approximate 54” diameter x 180” long, V sump style bottom outlet, (1) end dished, (1) end dished door on a davit arm, rated internal 100 psi at 68 to 212 degrees F. National Board# 22, serial# 99008060, built 2001. 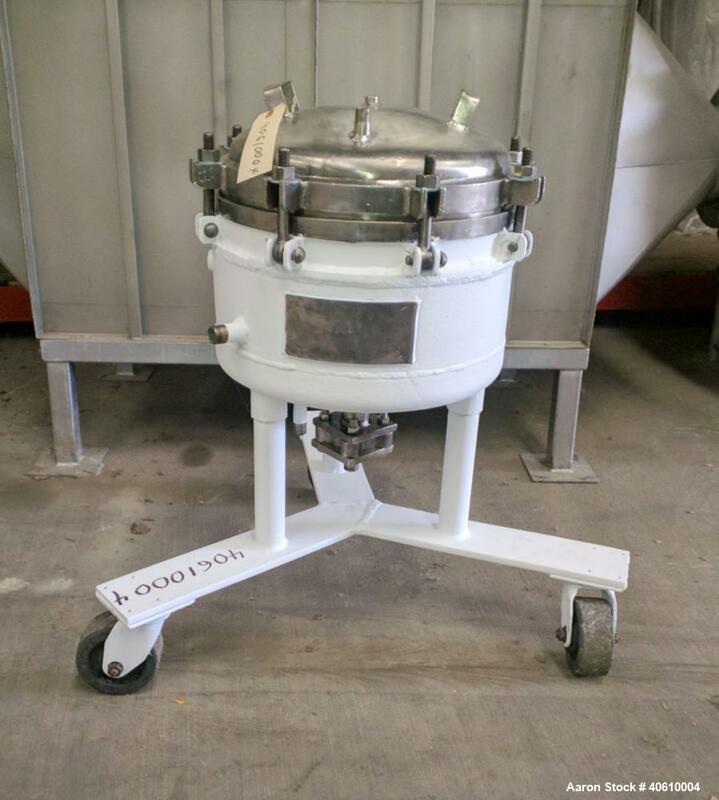 Used- AMA Filter Group LFC Lochem Roto Jet Wet Cake Discharge Filter, Approximate 990 Square Feet Filter Area, Model RJWCD 92/1200/44 DC, 316L Stainless Steel. Approximate (44) 1200mm (47.2”) diameter vertical filter leaves mounted on a rotating shaft, driven by a 2hp, 3/60/440 volt, 1720 rpm motor thru a reducer. Top mounted screen spray cleaning manifold. 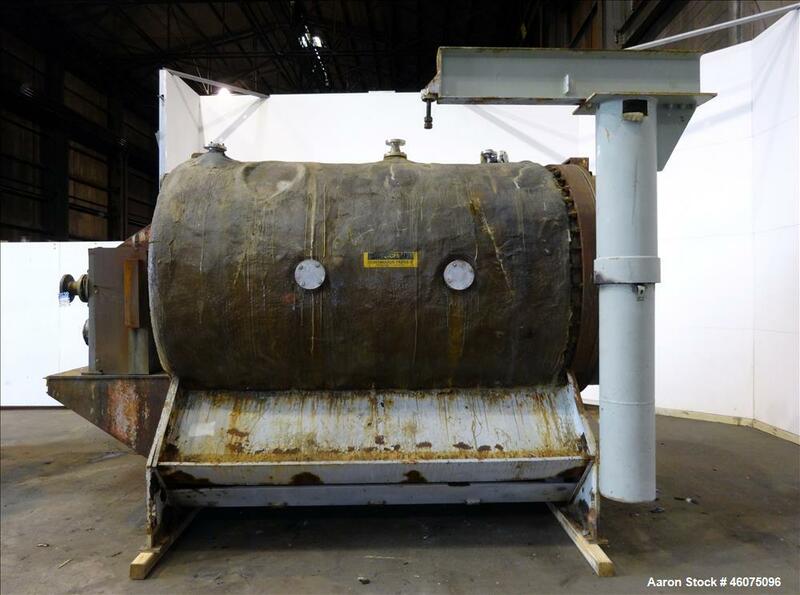 Horizontal tank volume approximate 96.8 square feet, approximate 54” diameter x 180” long, V sump style bottom outlet, (1) end dished, (1) end dished door on a davit arm, rated internal 110 psi at 68 to 212 degrees F. National Board# 181, serial# C0087839.1, built 2009. 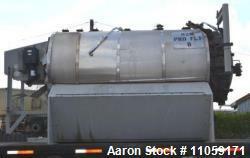 Used- US Filter Auto-Jet Self-Cleaning Pressure Leaf Filter, 1000 Square Feet Filter Area, Model 1200:1000, Stainless Steel. 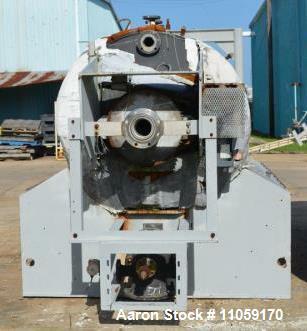 Horizontal shell approximate 67" diameter x 118" long. (26) 60" Diameter and (1) 52" diameter filter leaves. (1) End dished, (1) end dished door on a Davit arm, rated 200 psi at 300 degrees F. Vertical mounted filtration screens on a horizontal rotating shaft, driven by a 3hp, 3/60/230/460 volt, 1755 rpm gear motor, ratio 238 to 1, output 7.5 rpm. 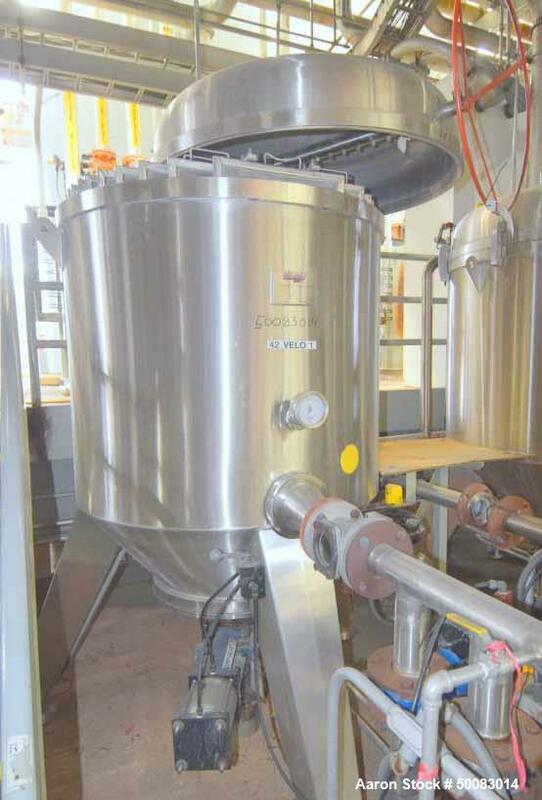 Includes a spray manifold with nozzles, and a 3hp bottom screw conveyor discharge. Serial# 6503682, National Board# 148. Used- U.S. Filter Auto-Jet Self-Cleaning Pressure Leaf Filter, 1600 Square Feet Filter Area, Model 1600, Stainless Steel. Horizontal shell approximate 67" diameter x 156" long. 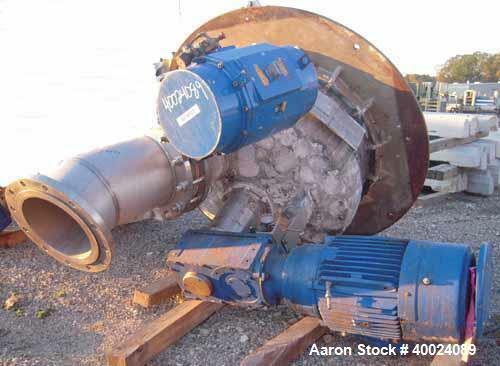 (1) End dished, (1) end dished door on a Davit arm, rated 200 psi at 300 degrees F. Vertical mounted filtration screens on a horizontal rotating shaft, driven by a 3hp, 3/60/230/460 volt, 1170 rpm gear motor, ratio 86 to 1, output 13.5 rpm. 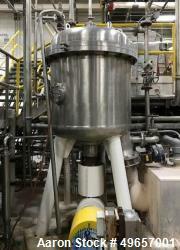 Includes a spray manifold with nozzles, and a 5hp bottom screw conveyor discharge. Serial# 11-1980, National Board# 959, built 1980.